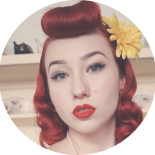 Burlesque Artist of the Week! I thought I’d set up a weekly performer of the week featuring astounding artistes from beginners to professional artists, both local and performers far from Perth! For my first featured performer I thought I’d pick someone close to home, a performer I’ve seen perform countless times, a lady I’ve even had the pleasure of teaching with, she made it to top 6 in the 2012 heat of Miss Burlesque Western Australia, being apart of the award wining Lucha Royale Show and she has the most beautiful curvaceous body you’ll ever see! Welcome the one the only Sugar Du Joure to the Stage! Don’t be fooled! Sugar isn’t always as sweet as her name! This vintage vixen turns into a sultry seducer on stage. Bearing all in the name of Burlesque! She is another stunning performer apart of the premier performance troupe Lady Velvet Cabaret where she performs amazing solo routines and also teaches the Burlesque Starlet class in Subiaco, only last Sunday a group of her dazzling students debuted on stage, and she debuted her new “Babalu” routine with gorgeous flowing pink fans! Sugar Du Joure and myself as well as many other amazing Azure and LVC performers will be taking the stage for our new Lucha Royale Show this June! Check out our Facebook Event for more details! This entry was posted on May 9, 2012 by Miss Lady Lace in Burlesque Performer of the Week!, Lady Velvet Cabaret, Uncategorized and tagged 2012, burlesque, burlesque artist of the week, burlesque show, classic, costume, fashion, featured burlesque performer, fringe festival, Lady Lace, lady velvet cabaret, miss burlesque, nicole, oldschool, people's choice awards, perth fringe festival 2012, pinup, rhinestones, showgirl, sugar, sugar du joure, vintage.